Living with Dementia: I am fine, maybe they got it wrong? I consider myself to be high functioning with my Alzheimer’s. In fact some days I can almost feel like there is absolutely nothing wrong with me. I’m ok. No problem. Maybe the diagnosis is wrong after all. Maybe I will continue being ok forever. Yeah! Then something happens and it throws me. Yesterday, I went out. It was 1:30pm and we went to a marina and I spent a little bit of time alone browsing in the shops. In the handbag shop I chatted to the assistant about Radley bags, Kipling bags, and I bought a new slimline Kipling purse for my small bag. I walked around another shop full of pale goods that have no function other than to look pale and interesting. All very nice, all very expensive. Next was another marina, I went into the shop and bought chocolate, and then sat on the bench outside to wait and watch the world go by. On to shopping to get some provisions in. We walked round the town, into the mall, around some shops, and on to the supermarket. My fibromyalgia was flaring up, my body was/is screaming with pain, have done some brass polishing on my boat previously. But, these things have to be done! We got home at 6:10pm. I hurt like hell and could barely move. 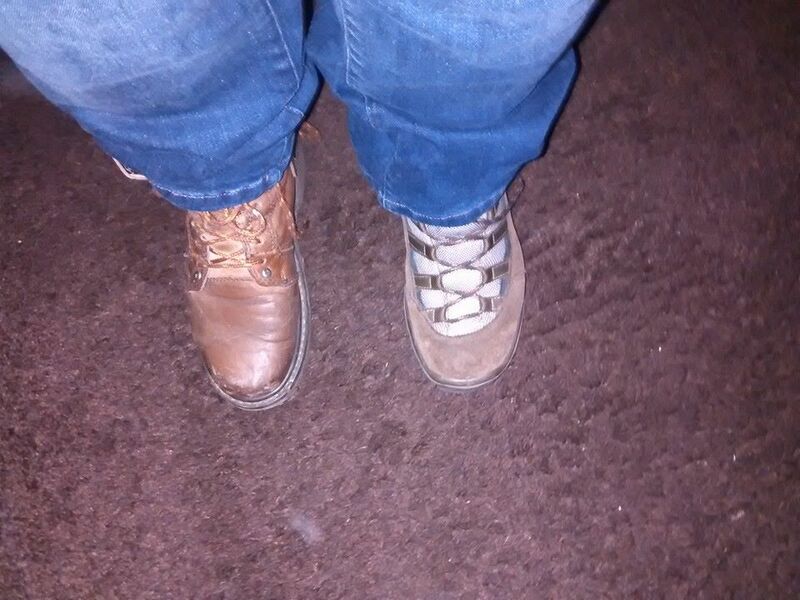 Took my coat off, dumped shopping in the kitchen, and bent down to take my boots off……………. HOW IN THE WORLD DID I MANAGE NOT TO NOTICE THAT!!! My first reaction was to laugh hysterically. Well who wouldn’t. Then, reality set in. Fear of not being able to dress properly. Ok this was not the worst thing in the world but it has ‘rocked my boat’ a bit. Author GillPosted on 26 February, 2015 26 February, 2015 Categories Dementia, My Alzheimer's JournalTags Alzheimer's, Confusion, dementia, early onset Alzheimer's, fibromyalgia, My Alzheimer's Journal14 Comments on Living with Dementia: I am fine, maybe they got it wrong? Dementia: Out of the mouths of babes.. I have just watched the most beautiful piece of film I have ever seen. I can guarantee that you will have never seen dementia viewed in this way before. How do you be with someone with dementia? How do you communicate? Children are the sweetest gift ever given to anyone and in this film young people talk about their grandparents who have dementia and how they deal with it. If it doesn’t bring a tear to your eye then I will be amazed! Produced by the BBC (British Broadcasting Corporation) for CBBC (the first ‘C’ standing for ‘Childrens’) this is a programme that is on air for children’s viewing times. I feel that this should be shown so that all adults can learn from children how to help their loved ones with dementia. Click on the link below to watch it. Josh, Ella and Hope all have one thing in common – they have a grandparent with dementia. It isn’t easy having to be ‘the grown-up’ when their grandparents get forgetful. But all three of them are determined to help them as much as they can. They all have their different ways of coping, which they want to share with other kids going through the same thing, and have recorded personal moments with their grandparents on their own cameras. Josh is determined to help his grandad remember and secretly gathers mementos for a memory box. Ella decides to organize a sponsored walk to help raise money for research into the causes of dementia. Hope’s granny gives dementia a character – Mr Alzheimer’s – to help Hope come to terms with it all. Author GillPosted on 11 February, 2015 11 February, 2015 Categories DementiaTags Alzheimer's, Children, Confusion, dementia, family, health, Memory8 Comments on Dementia: Out of the mouths of babes..
All places where people have to visit, or where they live such as care homes or in their own home should be places that are bright and homely. Seeing pieces of artwork or hearing sounds that they know may promote something that they have been interested in. It is important for music to be played at times with classical, pop, folk, country (not just a radio stuck on with a channel that the staff think will do too low to hear,) and then add some quiet times. When music is important the type of music is also important and a whole range of music genres. It is becoming well known that music is important to people with dementia stimulating some memories, and obviously that music has to be appropriate to each person. In fact we all have different tastes in about everything there is; music, colours, clothes, books, places – the list is endless but you get my drift. My interests include psychology research (because I took my degree in psychology and learnt that the mind and brain is truly fascinating, even if I struggle to remember what I learnt). I came across this article on art and thought it made interesting reading, because I believe it has a bigger picture to offer us (excuse the pun there!). Basically is shows that seeing art on the walls in a gallery have a more powerful effect than being shown a photo of a picture. I love art and there is nothing better I like than seeing a piece of art on a wall somewhere, not just in a gallery, but anywhere. Art with meaning in a cafe, shop, corporate building, or someone’s home. I have my own collection of art by various inluding a signed prints by artists Jack Vettriano (Night Geometry), and Susan Howells amongst other interesting artists. I am not a keep lover of some of the meaningless pictures you can buy in any high store depicting the fashionable ‘picture of the day’ such as a photo of a white flower pot with coloured plant in etc. How does all this to relate to this article? I think that ALL of these public and private places should be respect the cultural differences and display a whole range of good ( I reiterate that) GOOD artwork on the walls of these establishments. Nothing wrong with good prints in decent frames. Lets see some decent artwork around. People with dementia may have been art lovers too. So people working in care homes around the world, take a step back and think about what it is you would like to hear and see around you.